Paweł Pawlikowski follows up his Oscar-winning Ida (2013) with an even more magnificent tale of life in post-WWII Poland photographed in crisp, luminous digital black-and-white and composed within the confines of the 1.37:1 Academy aspect ratio. Pawlikowski’s narrative, inspired by the lives of his parents, is intentionally fragmented yet comprehensive and textured. Cold War tells the story of an obsessive, passionate, crippling love affair is set amongst contrasting settings: the bleak societal ruins and political corruption of Soviet-era Poland, and the freedom and decadence of post-war Western Europe. Tomasz Kot plays Wiktor, a musician assigned by Poland’s new Communist government to work as a kind of propagandist Alan Lomax; traveling the countryside collecting recordings of peasant songs, dances and other cultural traditions to teach in a state-sponsored academy. Joanna Kulig plays Zula, a teenager who auditions for the school. While her singing voice is nothing special, she certainly is. Mysterious, and wise beyond her years, Zula attracts Wiktor with, what can only be described as, her “star quality,” which Kulig conveys effortlessly. The ensuing relationship is deep and tumultuous, constantly interrupted over the course of two decades by a series of personal, cultural, and political upheavals as Wiktor and Zula travel separately and together—touring, defecting, living abroad, and enduring relocation—from Poland to Germany to Yugoslavia to France and back again. Pawlikowski contains this epic-scale romance in less than ninety minutes, like a black-and-white slideshow version of Doctor Zhivago but with two-thirds of the slides missing from the carousel. As with Ida, much of the narrative occurs off screen, with the absent story beats enriching the experience of the movie rather than diminishing it. Also like Ida, Pawlikowski and cinematographer Łukasz Żal utilize their black-and-white palette and the limits of their square frame to create impressions of time and place, rather than the sensational recreations so common to both modern and classic period films. As a result, the setting drives and informs the drama unfolding between the characters, but never upstages it. 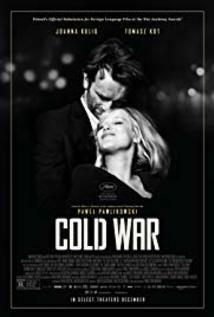 Cold War is an exceptional example of a minor sub-genre I’ll call, “the very long affair movie”—the narrative opposite but thematic cousin of my favorite sub-genre, “the brief encounter picture.” Films about protracted relationships that endure despite major obstacles, like Same Time Next Year (1978), Brokeback Mountain (2005), and One Day (2011), live and die by the chemistry of their lead actors. No matter how artful the screenplay, viewers won’t become invested in a film of this sort unless they believe the fascination and desire that drive the central couple back to each other again and again, despite severe risks and harm. Kot and Kulig make Cold War burn with passion: not only for each other, but also for art, culture, identity, and connection to a wider, freer world. Pawlikowski flawlessly utilizes the self-imposed limitations of B&W palette, 1.37 aspect ratio and 85 min running-time to create epic-scale romance about impossible passion—for love, art, culture, identity, and connection to a wider, freer world.